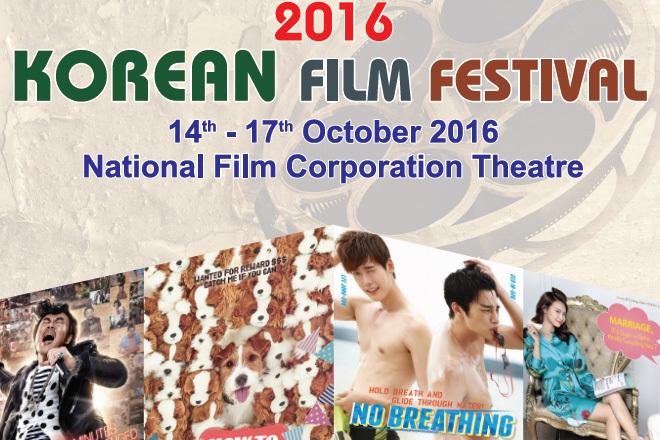 Following on the success of last year’s event, the Embassy of the Republic of Korea in Sri Lanka and the Korea Foundation will co-host the Korean Film Festival 2016 from October 14 to October 17 at the National Film Corporation (NFC) Theatre, Colombo 7, in partnership with the National Film Corporation of Sri Lanka. The opening ceremony will take place at 7 p.m. on the first day of the Festival (October 14), and “Born to Sing”—a comedy drama—is scheduled to be screened as the opening film. The Festival hopes to provide Sri Lankan people with an opportunity to better understand Korea’s culture and society through the medium of contemporary films. In total, four contemporary Korean films will be featured during the Festival for the general public on a first-come first-served basis. All movies will have English subtitles. The films to be screened are as follows: Born to Sing (Comedy Drama 2013), How to Steal a Dog (Family Drama 2014), No Breathing (Romance 2013), and My Love, My Bride (Comedy 2014).